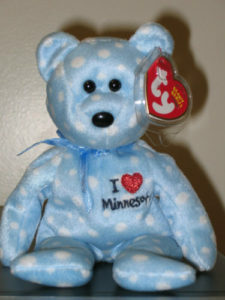 In 2004 Ty released a series of State Specific Beanie Babies to be sold in stores. As you can see, none of the state series Beanie Babies are worth very much money. Some of them will sell online, for between $5-$9, but it would be rare for you to get over $10 + shipping if you tried to sell one. The only one that seemed to sell for a premium was Hawaii. Not every state was featured in the state series.